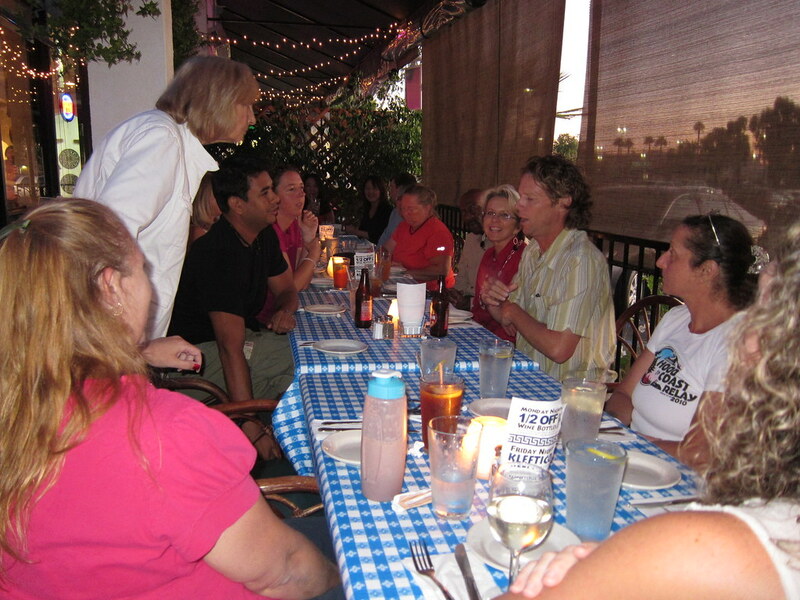 The Green Girl attended the Sole Runners Athens Classic Marathon Kick-off dinner last night at George's Greek Cafe. Debra and Julie from Cartan Tours, the travel agency handling our reservations, joined us for the dinner. We started off by going around the table and doing informal introductions. We discovered there will be three first time marathoners and we all cheered them on. Before handing out the travel packets, Julie went over some of the high level details and answered our questions. It's tempting for me to want to participate in a lot of the day tours because I want to see everything but I am restraining myself because I want to conserve my energy for the big day. Jackie is of a similar mindset so it works out well since we are traveling together. 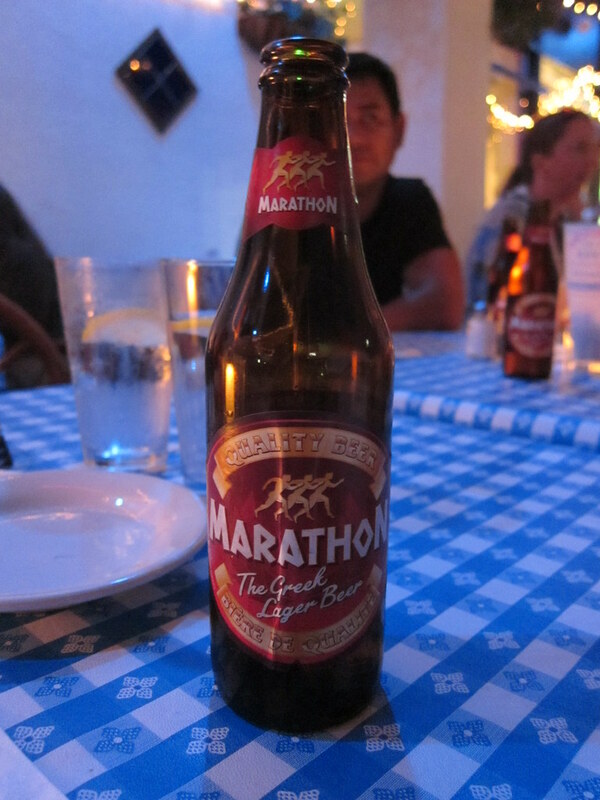 A few runners sipped on bottles of Marathon Beer as we compared travel plans and training schedules. I was thrilled when Coach Steve mentioned he will be doing early morning yoga classes. The day before the race, a bus will drive us along the marathon route. I have mixed feelings about this as I'm one of those people who avoids looking at course maps prior to races. We spent some time pondering what we might expect from the expo. 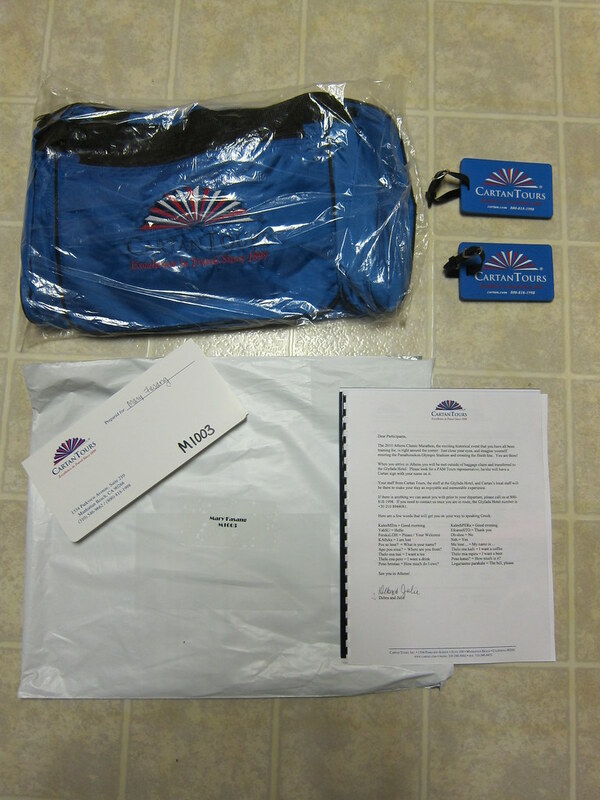 In our travel packets, we received an informational booklet, travel vouchers, food coupons, and a lightweight Cartan Tours duffel bag. I can't believe the marathon is next month. It really started to sink in for me last night as we were all sitting there talking. I need to focus on staying healthy, take care of my right foot, and be cautious of my left knee. How exciting for you. Wow! You are going to have such a good time. Can't wait to read all about it. Holy moly...time is flying by for sure! I'm very excited for you!!! Did they make any suggestions on if you'd have to change how you eat while there? or if you can find the same stuff to eat there as here? This makes it more real, doesn't it? What an exciting experience you are having. I can't believe is going to be here so soon! I am so jealous but now I know that I made the right choice in not going for t his. You will rock it and I can't wait to hear all about it! Oh, I'm so excited for you!! That is going to be an amazing experience, so cool that you got to meet everyone ahead of time. thanks so much for your comment on my marathon post, I can't believe it's already over! How exiting! It's coming up so fast! I wish I were going with y'all. I may run this race eventually, there this is a big year I am sorry to miss. Have a great trip and enjoy the experience. Hope you had some Moussaka for me! How exciting - I can't wait until we get to see Athens up close thanks to the Running Green Girl!